WASHINGTON (AP) — President Donald Trump offered a shifting rationale this past week for his firing of FBI Director James Comey and joined other Republicans in exaggerating how much simpler it will become for Americans to file their taxes next time. He also erred, though by just a hair, in claiming a historic achievement in black and Hispanic joblessness. TRUMP: “Slippery James Comey, the worst FBI Director in history, was not fired because of the phony Russia investigation where, by the way, there was NO COLLUSION (except by the Dems)!” — tweet Wednesday. 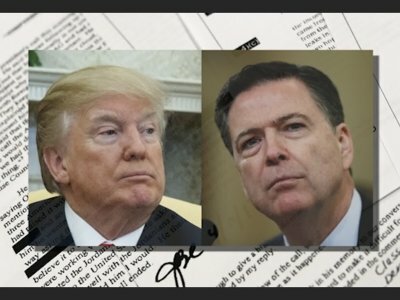 Comey’s firing, and Trump’s subsequent suggestion that the investigation into Russian meddling in the election was a factor, led Deputy Attorney General Rod Rosenstein to appoint special counsel Robert Mueller to oversee the probe. Mueller now is examining the Comey firing as part of an investigation of potential obstruction of justice by the president. The wide-ranging investigation also has been looking into potential collusion between the Trump campaign and Russian interests. Trump’s rationale for dismissing Comey has changed before. Initially, the White House attributed the firing to Comey’s handling of the FBI’s investigation of Hillary Clinton’s email practices. Trump contradicted that explanation in his NBC interview, and now has changed it again. TRUMP: “This is the last time you’re going to fill out that long, complicated, horrible return. ... Tomorrow, last day. Very importantly, next year, it’s going to be a simple — for the most part, one page. It may get a little bit bigger. But it will be simple and easy to do.” — remarks in Hialeah, Florida, on Monday. VICE PRESIDENT MIKE PENCE: “Thanks to the historic TRUMP TAX CUTS, today marks the last time the American people will file taxes under a complicated & outdated tax system.” — tweet Tuesday. In fact, there’s no sign the IRS is planning new filing forms, card-size or otherwise, for the 2018 tax year. Many taxpayers will indeed have an easier time filing because of the doubling of the standard deduction. But they’ll still have to do legwork to figure out their taxable income and whether they qualify for the deduction or would be better off itemizing. They will also need to figure in the hit they could take from the capping of deductions for mortgage interest and state and local taxes. Tax-filing migraines are not vanishing. TRUMP: “Unemployment for African-American workers, for Hispanic workers, unemployment is at an all-time-low in history. In the history of our country, it’s at the lowest point.” — news conference Wednesday. PENCE: “Our Tax Cuts- the largest in American history- will save YOU money, increase opportunity & create more JOBS for American workers.” — tweet Tuesday. They considerably trail Ronald Reagan’s 1981 tax cuts, Barack Obama’s 2013 extension of George W. Bush’s tax cuts, and more. The estimated cost of Trump’s package is $1.5 trillion over 10 years. In October, before the details were complete, the nonpartisan Committee for a Responsible Federal Budget assumed a higher value to the package — $2.2 trillion. Even that more significant plan ranked as only the eighth largest in history as a percentage of the GDP and the fourth largest by another measure — inflation-adjusted dollars. Trump has persistently called his cuts the biggest in history. But, notably, he pulled that back a notch in his USA Today piece published Tuesday, even if his vice president didn’t. TRUMP: “Russia and China are playing the Currency Devaluation game as the U.S. keeps raising interest rates. Not acceptable.” — tweet Monday. THE FACTS: Trump’s claim misstates the current economic situation and contradicts his own Treasury Department, which several days earlier released a report showing no country was labeled a currency manipulator. Trump’s tweet also inaccurately describes the economic situation. China’s currency, the yuan, has actually been rising in value and now stands at the highest levels against the dollar in about three years. By contrast, Russia’s ruble has been falling against the dollar and did plunge sharply last week. But that reflected new economic sanctions the United States imposed on Russia — not rising U.S. interest rates or efforts by the Russian government to drive down the ruble’s value. Trump is correct that rising U.S. interest rates could contribute to boosting the dollar’s value against other currencies by making investments in the United States more attractive to foreign investors. But U.S. interest rates are only one factor that can determine the dollar’s value against other countries. It is not clear what Trump meant by calling the current situation “not acceptable.” It is true that a stronger dollar can increase America’s trade deficit by making American exports more expensive in overseas markets while making foreign goods cheaper for U.S. consumers. But the Federal Reserve’s current moves to gradually raise U.S. interest rates are being taken to ensure the economy does not overheat at a time when unemployment is at a 17-year low and the economic expansion is now the second longest in U.S. history. Previous administrations have usually been careful not to make public comments about Fed interest-rate policies to protect the Fed’s political independence. Associated Press writers Zeke Miller, Christopher Rugaber and Josh Boak contributed to this report.